This overview of the Hill Country Christadelphians scarcely does justice to the impact these early pioneers had on the Truth in North America. The Oatmans and the Bantas and others baptized many, many converts in the Hill Country during the 1850s, ’60s, ’70s, and ’80s. Other prominent names from the early days are still much in evidence around Texas — Greer, Tanner, and Wolfe. Where I grew up, you have to realize, the plural of “Wolfe” was not “wolves”, but “Wolfes”! The Hill Country was such a demanding place to live, however. It was a land that chewed men up and spit them out. The pendulum swings between rainy years and dry years were large and frequent. And many early settlers lost much, or all, they had in the droughts, Indian raids, and other hardships. So, after years of hard times, and lured by promises of other lands to the west, many Christadelphian families packed up their belongings and embarked upon further migrations. The first Christadelphians of New Mexico were three families who left the Hill Country together, in about 1890, with their wagons and herds of cattle, and set out for Oregon. But difficulties of travel, and problems with border patrols, held them up, so that when they heard of free land to be had in the mountains of New Mexico, they changed their plans and stopped there. And their descendants remain there still. Other early Texas Christadelphians migrated as far as California in the last part of the 19th century. One whole ecclesia, of 60 or 70 members, uprooted itself and moved practically en masse to the west coast. And so it is that, to this very day, many of the names of California Christadelphians like Wolfe and Banta bear evidence of their Texas roots. Other Texas Christadelphians, or their children, made it as far as Oregon in later years. And so, out of the struggles, trials, and heartaches of the early Christadelphians in the Texas Hill Country, there were spread abroad, across the whole of western America, migrating bands of believers who planted the seeds of the Truth in the furthest reaches of the United States. It may be said, then, that the Oatmans, the Bantas, and the Johnsons have never lacked men and women to stand before the Lord, from that day to this. And we pray, and trust, that their lines will continue until the Kingdom of God comes. Sam and Eliza Johnson’s youngest daughter was Jessie, my grandmother. Jessie was born in 1887, and of course I only knew her in the last 20 or so years of her life, and the first 20 or so years of my life. Nevertheless, she had a great influence upon me in those formative years. This photograph was taken about 1895, in front of the Johnson homestead. The successor house still stands just across the road from the Johnson family cemetery. The young girl in the picture, looking a bit angry and defiant, is my grandmother, Jessie Johnson (later Jessie Hatcher). She was the youngest of all the children, born in 1887. I find it very interesting that my grandmother lived and is buried in the very same place, about 85 years apart — she died in 1973. I knew her quite well, she was my only living grandparent and a real influence as I was growing up. Through her especially I met a lot of the older Christadelphians of her generation and heard lots of stories. She was always staunch and determined in her attendance at all Christadelphian meetings. Although she was a Berean Christadelphian, she always made a point of attending all Central and Unamended gatherings within driving distance. After all, she had known many of the brothers and sisters, of all fellowships, before the divisions had even happened. Later on, when I had a driver’s license, she enlisted me to drive her to all the gatherings. As my grandmother’s chauffeur, I met and listened to the best of visiting Central Christadelphian speakers, as well as the best of visiting Unamended speakers too — including several generations of the Zilmer clan, considered by many to be the first family of North American Christadelphians. Grandma was also a voracious reader, a fierce defender of the faith, outspoken in all her opinions. I remember as a child, being somewhat embarrassed during lectures and exhortations, because Grandma would speak up and audibly recite along with the speaker whatever Bible verse he was quoting. And occasionally she would interject a loud “Amen!” as well. I still have, today, many of her Christadelphian books, with her name in the front, and her notes in the margins, and various passages boldly underlined. And when Grandma underlined something in her books, she never underlined it lightly. It was always boldly underlined! Jessie Hatcher (left), her nephew Lyndon Johnson, and their cousin Oreole Bailey. Jessie and Oreole were both lifelong Christadelphians who told reporters that they did not vote for Lyndon in 1964. This was when he won the Presidency in his own right, after the death of the previous President, John Kennedy. 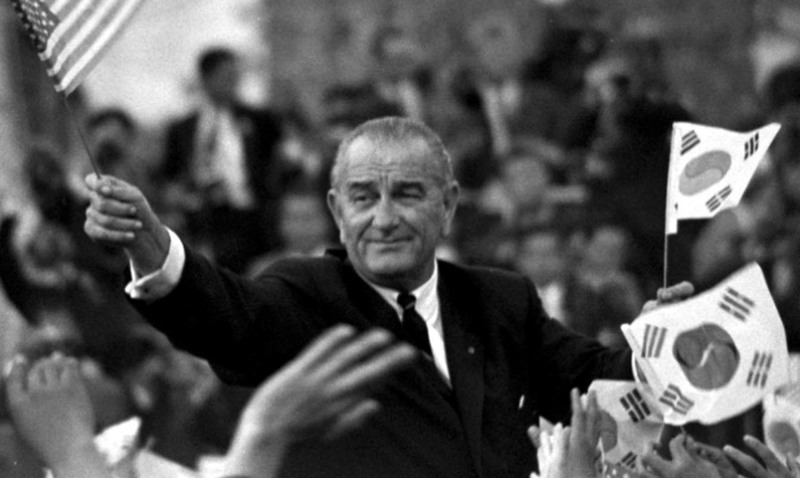 LBJ in his motorcade while visiting Seoul. 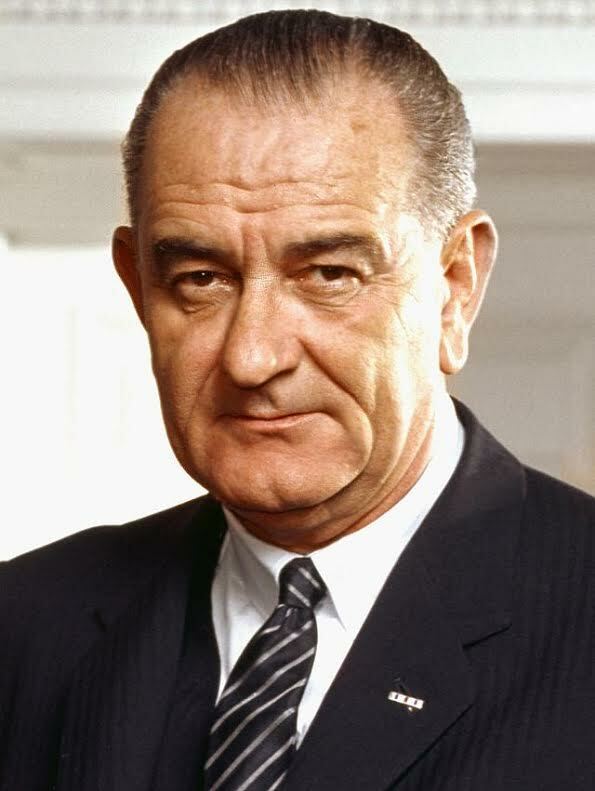 LBJ during his term as President of the United States. His fondness for her was shown when he became President upon the death of John Kennedy. Soon thereafter, Lyndon invited his Aunt Jessie to come to Washington, D.C., and live with him and his family in the White House. But she declined, and chose to live very close to her only child, my mother Ruth, and her family — Dad, myself and my younger brother Wesley. Of course, this kept her close to her beloved Christadelphian brothers and sisters in Texas also. Grandma did accept invitations to visit the White House, as well as an invitation that came her way to visit Israel and meet Prime Minister Golda Meir, the first (and only) woman to lead the State of Israel. But she was always eager to get back home, so she could go the Christadelphian meetings, and not lose touch with her real family and her faith. 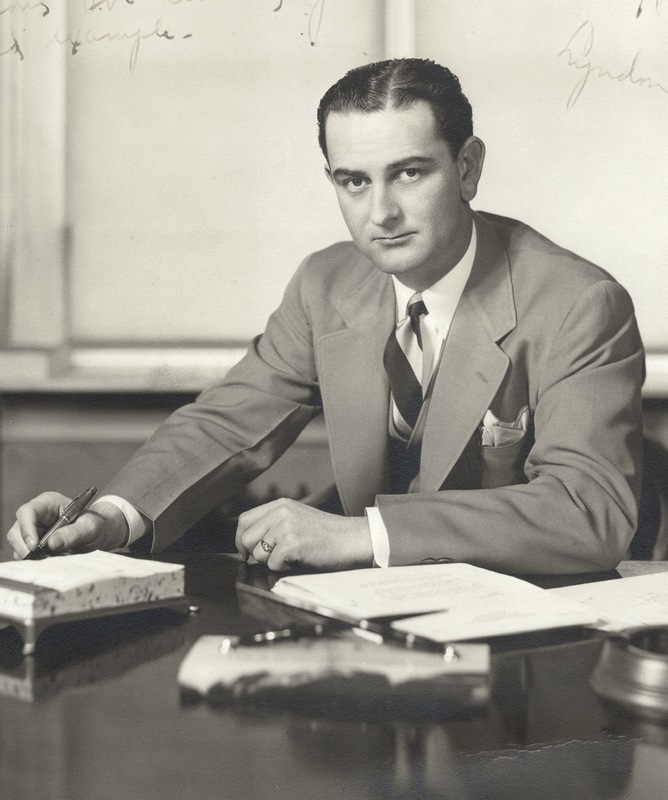 A picture of LBJ in about 1938, as a young Congressman. This was the time of what came to be called “Operation Texas”, getting many Jews out of Europe ahead of Hitler and the concentration camps. Grandma died in 1973, at the age of 86, only a month after her nephew Lyndon died. She was buried in the Johnson Family Cemetery, near him, but also near her own parents and the other Christadelphians now buried there. By now, these include my father, mother and brother also. Many Christadelphians now rest there, awaiting the resurrection. It is a mile or so down the road from the old Christadelphian campground, still in use after more than a century. The old cemetery is the nearest thing I know to holy ground. I visit it often, and listen in hopes of hearing the familiar voices again. Note: There is a little-known episode in the life of Lyndon Johnson, now called “Operation Texas”, in which he worked diligently to save many European Jews out of a Nazi-threatened Europe before World War II began. This is discussed in some detail in my book, A Bible Journal, in the chapter entitled “Lyndon Johnson and the Jews”, pages 167-173. A Bible Journal may be ordered from The Christadelphian Tidings, http://www.tidings.org. The second eldest daughter of Sam and Eliza Johnson was named Frank — not Francine, nor Frances, nor Fran, but Frank. The family story is that, since the eldest child was a daughter, Sam now wanted a son and had already decided on the name. So when Eliza gave birth to another daughter instead, the selected name stayed anyway. Some people say Texans can be very stubborn; they may be right. 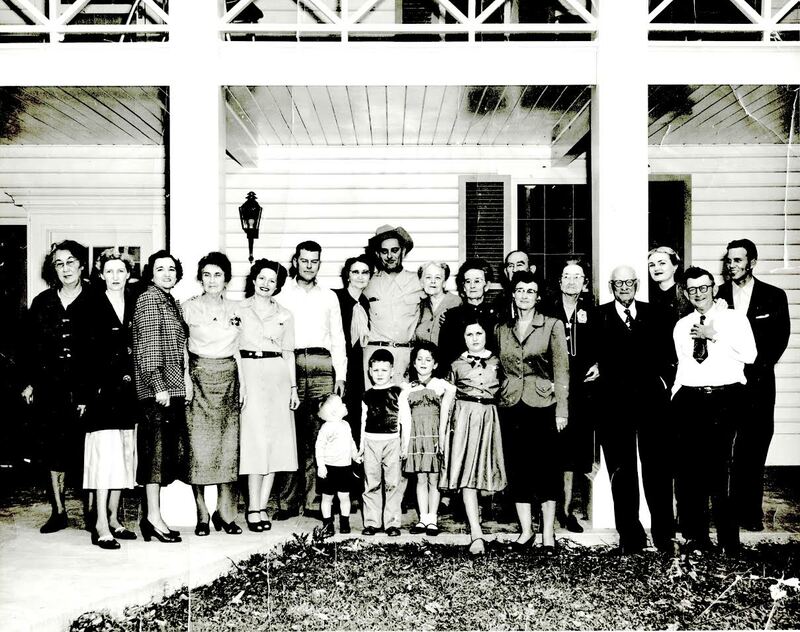 The extended Johnson family at the ranch near Stonewall, Texas, about 1953. 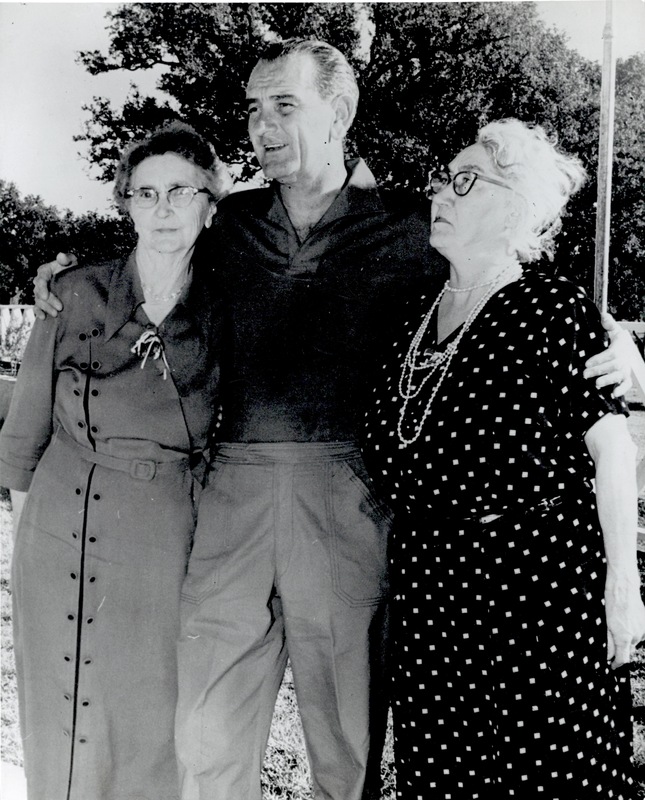 My grandmother, his Aunt Jessie, is to the left of Lyndon Johnson, and his mother Rebekah to the right. I am about five years old, standing directly in front of Lyndon. My brother Wesley, age 2, is holding my hand while looking back at Lyndon and our grandmother. Our father Eldon is between my grandmother and Lady Bird Johnson (Lyndon’s wife), and our mother Ruth is second from the left, just to the right of Cousin Oreole. The family picture also contains a number of other Christadelphians. The fourth person from the left of the photo is “Aunt Frank” Martin, who has a chapter devoted to her in my notes. Frank, born in 1870, become a lifelong Christadelphian, and was very devoted to the Truth. Sister Frank Johnson Martin died in 1961 at the age of 91. As a small child in the 1950s I can remember attending Sunday meetings in her house — a large, rambling old farmhouse. This house was later bought by her nephew Lyndon Johnson and converted into what came to be called the Texas White House during his presidency. In my childhood memories — probably equal parts fact and fantasy — I always thought of my great-aunt Frank Martin and Eleanor Roosevelt as standing on equal terms. First of all, they were roughly the same age; secondly, they resembled one another more than a little. And finally, they were both, in my mind, larger-than-life women of consequence, who had a lot to say about national and world affairs. And they were both women to whom many important men deferred. For those of you who don’t recognize the name, Eleanor Roosevelt was the First Lady, that is, the wife of Franklin Roosevelt, who was President of the United States during 13 years in the 1930s and the ’40s, the years of the Great Depression and World War II. During her husband’s presidency, Eleanor was almost certainly his most trusted advisor. Because of the polio which confined him to a wheelchair, she was also his eyes and ears to report firsthand on much that was going on in the country and the world. After his death, she became ambassador to the United Nations, and advisor to other Presidents, and an altogether serious force in American politics for another 17 years or so — probably the first American woman of which that could reasonably be said. The interesting thing about that is: When I ranked Aunt Frank alongside Mrs. Roosevelt, I may have been more correct than I could have imagined. In national and international affairs, Eleanor Roosevelt loomed very large. But in the very much more limited world of Christadelphian affairs, in parts of the United States and elsewhere, Sister Frank Martin was perhaps just as important. Frank and her husband owned a large ranch near Stonewall, Texas, just a few miles west of Johnson City in the Texas Hill Country. 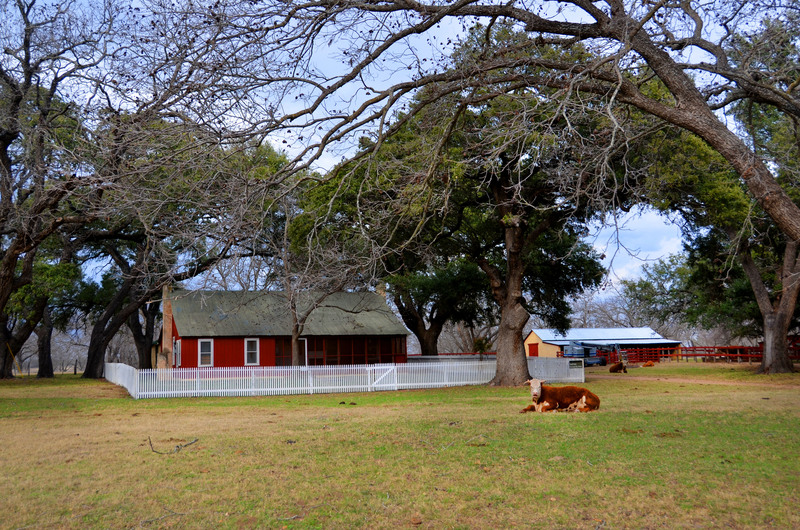 The ranch house became something of a landmark for Christadelphians both in Texas and elsewhere. It was near the old Christadelphian campground, and a place where many brothers and sisters would gather from time to time for Bible study, fellowship, and worship. On such occasions and in private also, Sister Frank offered sound scriptural advice to brothers who asked, and her words were highly valued. In between, she is known to have gently and diplomatically played matchmaker when the situation called for it, and with some success, as some folks living today can attest. Frank’s husband, Clarence Martin, was in politics, like Sam Johnson, Jr., his brother-in-law. He was a state legislator and then state district judge in the Texas Hill Country. But Frank had always encouraged him, subtly sometimes, to read the Bible and understand it. When he went to Austin for legislative sessions, or for court duty elsewhere, she always packed something to read in his luggage — perhaps Elpis Israel or Seasons of Comfort or similar reading, to go with his Bible. Mostly, he never gave any indication that he was reading, but eventually, when he retired, he was finally baptized as a Christadelphian and remained faithful to the Truth until his death. This is the Johnson Ranchhouse, also called the Texas White House during the Presidency of Lyndon Johnson (1963-1969). It was originally owned by Clarence Martin and his wife Frank Martin, as mentioned in my story, and was bought by Lyndon and Lady Bird Johnson from his Aunt Frank during her later years. It is now owned and administered by the state of Texas and the United States park services. Both before and after her husband Clarence’s death, Aunt Frank was an eminence in the Christadelphian brotherhood in North America. One prominent brother from Canada, visiting Texas in 1952 to attend the Texas fraternal gathering, a weeklong activity similar to today’s Bible schools, wrote in a circular newsletter of meeting Sister Frank Martin, whom he called “a mother in Israel”. He added: Sister Martin has been a succourer of many, and like Paul I can say, “and of me also”… she has spent a good portion of her life in the truth, and what a colorful pilgrimage it has been… Sister Martin has taught the truth to many and is still watchful over God’s children and keeps the brood under her protecting wings… she is loved and respected by all who know her, in the truth and those not in the truth. She lets her light shine before men, as her nephew, Lyndon Johnson the [United States] Senator, said of her when someone remarked of her not being at home: “Aunt Frank will not be found home until the Christadelphian gathering is over.” Truly a wonderful testimony from one not in the truth to one that is in the truth, and it was not spoken in sarcasm, but with a soundness which he knew and also fully respected; for as men and women can see that our sister has been with Jesus. One incident about Aunt Frank stands out in my memory, as told years ago by one of my older cousins. It was about 1922 when two circumstances converged, more or less. First, Aunt Frank’s husband, not yet a Christadelphian, was district court judge for the Hill Country region. And second, the brothers and sisters meeting regularly at the old campground, just down the road from their ranch near Stonewall, felt they needed more than just the old building and the outdoor covered “tabernacle”; they needed a proper meeting hall on the Christadelphian land. The problem was they lacked funds even to buy building materials. As she listened to the brothers trying to figure out how to raise the necessary funds, Sister Martin volunteered that she would take care of the money if the brothers could manage the building project itself, and they readily agreed. My cousin could tell this story because she accompanied her aunt on her tours around the Hill Country. Aunt Frank decided that it was only right that, as the wife of the judge in the region, she should pay calls to as many constituents in the area as possible, to introduce herself and get to know them better. Taking her young niece along and driving herself, she set out, day after day, to make her rounds. In addition to letting folks know who she was, and especially who her husband was, she talked with them about anything and everything else in their lives. Then, before she departed from each place, she mentioned that, by the way, she was also collecting funds to help build a Christadelphian church at the old campgrounds. Not surprisingly, perhaps, practically everyone was happy to donate to this worthy cause. When she had finally collected all that was needed, she delivered the funds to the brothers and informed them that her work was finished, but theirs was just beginning. I can add that the church structure still stands today, more or less as it was when first finished almost 100 years ago. More than half of the 50 or so folks buried here are Christadelphians. They include: my great-great grandmother, Priscilla Bunton, the first Christadelphian in the family; my great grandparents, Sam Ealy Johnson and Eliza Bunton Johnson; my grandmother, Jessie Johnson Hatcher; my parents, Eldon Booker and Ruth Hatcher Booker; my brother and only sibling, Wesley Booker; as well as a number of great-aunts, some cousins, and a few close friends of the family (who were not related by blood but simply by faith). The cemetery is administered by the United States National Parks Service. In her later years, and when overseeing the ranch itself became too much for her, she sold her house and lands to her nephew Lyndon Johnson, then a United States Senator. Frank herself, with another Christadelphian lady Margaret Martin as a companion, took up residence in a small house in nearby Johnson City, the house which had been a Johnson family residence and Lyndon’s boyhood home. 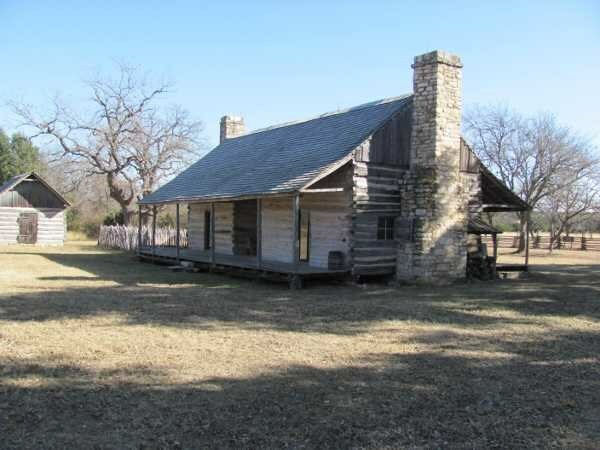 This much smaller residence also became a destination for many folks to visit during her last years — Christadelphians from around Texas and the country. My brother Wesley and I slept a number of nights on the screened-in porch of that house during the summers, while our mother and grandmother were visiting Aunt Frank. Sister Frank Martin died in 1962, at the age of 91, and is buried in the Johnson Family Cemetery alongside so many relatives and other Christadelphians. 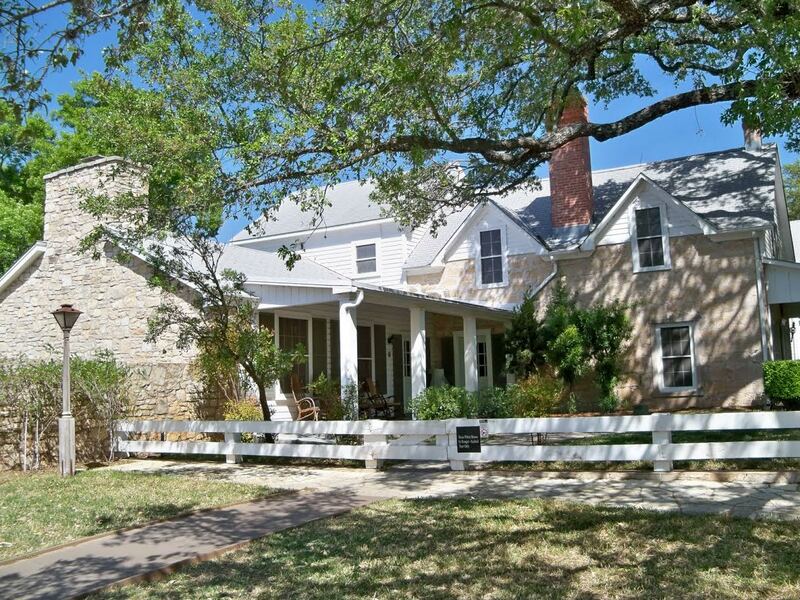 Meanwhile, the old ranch house, refurbished and expanded, became the famous Texas White House during Lyndon Johnson’s presidency from 1963 to 1969, and a place where various important politicians and heads of state visited. It is still part of the Lyndon Johnson National Historical Park. How this aspect of his life can be reconciled with his continued profession as a Christadelphian I am still not sure. My guess is that the Christadelphian prohibition against voting and political involvement was not so well-enforced for those living on the Texas frontier, as it became later. I am not trying to excuse anyone; I am just trying to explain. I should add that there is some evidence that, on at least one occasion, brother Sam Johnson was disfellowshiped by other Christadelphians for his political activities, and then reinstated into fellowship a bit later, probably after the campaign and election were over. Sam and Eliza had six daughters, who were all baptized and became practicing Christadelphians, including Jessie Johnson (later Jessie Hatcher), my grandmother. One of Sam’s sons, Sam Ealy Johnson, Jr., did not embrace the Truth but made politics practically a full-time career, served in the state legislature and in other public capacities. He campaigned publicly, and somewhat dangerously, against the Ku Klux Klan in the 1920s, and was responsible for the legislative bill that restored and preserved the Alamo as a state landmark. Sam, Jr.’s son, Lyndon, was certainly influenced by early years around his Christadelphian grandparents and aunts and uncles, as they all attended Sunday school and other meetings. But a young Lyndon was obviously drawn to his father’s world of politics — more than he ever was to the Hope of Israel. There are some real indications, however, that certain aspects of Christadelphian teaching remained with him throughout his long political career, especially in his high regard for the Jews as the people of God, and in the newborn nation of Israel in the Middle East — and also in his vision of a “Great Society” of peace, prosperity and brotherhood for all, which in retrospect seems to have been drawn directly from the prophecies of Isaiah as read and interpreted by Christadelphians. Sam Johnson was reared a Baptist… but later affiliated with the Christadelphians. He was a consistent and devout member of this church until his death from pneumonia, at Stonewall, Texas, on February 25, 1915. Highly gregarious, he attended all the neighborly gatherings and met his friends with a handshake, friendly greetings and a resounding laugh. He seldom returned from these gatherings without accompanying guests, and was widely known for his hospitality and kind friendliness. A man of strong courage, deep convictions and a calm philosophy which allowed no worry, he lived serenely and quietly at his pleasant country home on the bank of the Pedernales River, from 1888 to 1915, almost thirty years. Prior to that he led a very active, energetic, often hazardous, existence. He was a tall, well-built, rangy man, six feet in height, with black wavy hair and blue eyes. His snowy beard and thick mane of white hair in his later years gave him a patriarchal appearance. He loved to sit on the front porch of his farm home reading his Bible and the newspapers, and greeting the frequent visitors with a hearty invitation to get down and come right in for a good visit. Although he had a high temper, he was seldom seen in anger and never in his life used an oath. He had a very deep and abiding faith in the Christadelphian creed, and, when dying, fully conscious, spoke to his loved ones, assuring them of his complete readiness to meet his Maker and of his sustaining hope of eternal life. His death, as his life, was an inspiration to those who knew him. I have often thought, as I considered this obituary, that there can scarcely be any better combination of reading materials, and any better way to spend one’s leisure time. Sam Johnson, my great-grandfather, spent his last years on his front porch, alternately reading his Bible and the latest news of the world, and pausing to visit with those who passed by on the road in front of his little house. How often did yesterday’s news explain the Bible? How often did the two- or three-thousand-year-old Bible explain yesterday’s news? For some one instructed in the true gospel, the two forms of reading would proceed in tandem, and a man might keep one eye on this world, while the other eye — the eye of faith — was firmly fixed on the world to come. Note 1: There is more about my grandmother, Jessie Johnson Hatcher, and other members of the Johnson family, in my book On the Way, in the chapter entitled “Scenes in a Country Cemetery”, pages 215-219. On the Way may be ordered from The Christadelphian Tidings Publishing, http://www.tidings.org. Note 2: Gregg Cantrell has a quite interesting discussion about how Sam Johnson, Sr., and his politics, as well as his Christadelphian religion, relate to the politics of his grandson, President Lyndon Johnson. This is entitled “Lyndon’s Granddaddy: Samuel Ealy Johnson, Sr., Texas Populism, and the Improbable Roots of American Liberalism”, Southwestern Historical Quarterly, Vol. 118, No. 2 (October 2014), pp. 132-156. Cantrell is Professor of Texas History at Texas Christian University in Fort Worth, Texas. Samuel Ealy Johnson, Sr. (1838-1915) was born in Alabama, the youngest of ten children. About the time Texas joined the United States, in 1845, his family had moved to the area of Lockhart, just south of Austin the state capital. After his father died, Sam, still barely 20, moved to the Hill Country, west of Austin, where he worked with his older brothers in the ranching business. Like most young men at the time, Sam enlisted in the Confederate Army when the Civil War started, and served in a cavalry regiment. He participated in several fierce battles, had a horse shot out from under him, and saw many men wounded and killed. After one great battle, he helped the surgeon hold down wounded men while their arms or legs were amputated. He survived the war relatively unscathed and, while we cannot know how much the memory of that war remained with him the rest of his life, we do know that he was a friendly man, unfailingly generous, kind and helpful to others, and that he faced many challenges with courage and good humor. This is what survivors learn to do. When the war was over, Sam entered into business with his brother Tom Johnson near what became the little town of Johnson City, in the Hill Country. The name came, of course, from the Johnson family which settled the area. “City” implies a much larger town than it was actually was; even today the population of Johnson City is only about 1,500. By 1867, he had married and begun a family, and had also started buying and assembling herds of cattle to drive north on the old Chisholm Trail for sale at the railhead in Abilene, Kansas. His wife, Eliza Bunton (1849-1917), was a daughter of an influential family in early Texas. One Bunton was a signer of the Texas Declaration of Independence from Mexico, a signer of the Constitution of Texas, a hero of the Battle of San Jacinto (which secured Texas independence), and a member of the first Congress of Texas. Her family were wealthy landowners, with a plantation and numerous slaves in earlier days. And her mother, Priscilla Bunton, was the first Christadelphian in her immediate family, and the first person buried in what is now the Johnson family cemetery on the Johnson Ranch. Eliza Bunton Johnson is remembered as a beautiful young woman, with raven hair and piercing dark eyes. She was tall and regal in bearing, an intelligent and educated woman of refinement. Despite her well-to-do background, she became a quintessential pioneer woman, tireless, hardworking, and always ready to care for others — as was so important for people living on the Texas frontier in dangerous times. Eventually, she and Sam had nine children, six of whom were baptized as Christadelphians. This is the cabin built by Sam Johnson, Sr., when he and Eliza first settled in the area that became Johnson City. In the basement this cabin, Eliza hid herself and her baby daughter while Indians raided the house. In the beginning of the settlement, Sam Johnson was also required by circumstances to be an Indian fighter. This territory was on the very edge of civilization, and the Indian tribes still encroached here and there. (In fairness, it should be said that the Indians must have felt that the white men were the ones who encroached on their territory.) In 1869, after a particular raid by Indian warriors in which some neighbors were killed, Sam and other men of the area set out to track down the Indian party, leaving Sam’s wife Eliza and infant daughter Mary home alone. When other hostile Indians approached the farmhouse, Eliza took her baby and hid them both in the cellar. Once in the cellar, she used a pre-set wire to pull a rug over the trapdoor to hide their whereabouts. She used a diaper to stifle the baby’s cries, while the Indians ransacked the house. The very site where this happened can still be seen today. 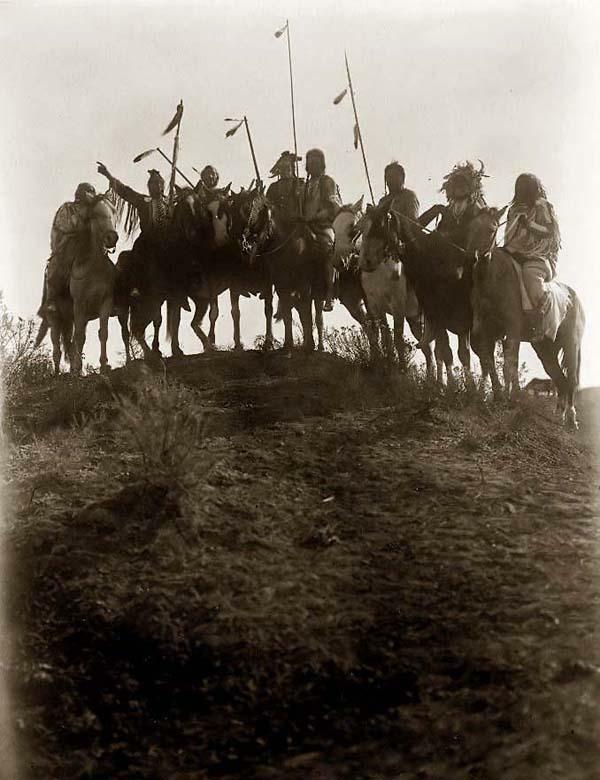 Eight Crow Indians on horseback, silhouetted on the top of a hill. The American-Indian wars took place from the 1600’s to early 1900’s. As a small child, I was always especially interested in this story, since Eliza Johnson was my great-grandmother, and another of her daughters, my grandmother Jessie, was scripturally speaking still in the loins of her father (cp Heb 7:5,10), and the womb of her mother, at that time. The reader may well imagine how I felt, when it dawned on me that Eliza’s survival of the Indian attack was crucial to my own existence too. Since Grandma hadn’t been born yet, Mom couldn’t have been born either, and I was a long, long way from seeing the light of day — so there was a lot riding on that diaper keeping the baby quiet. Every time thereafter when I heard the same story, I listened intently to be sure that it turned out the same way. When it did each time, I was always relieved. The same ending each time seemed to confirm to me that everything was working out well, so far! Sam and Eliza and Eliza’s mother Priscilla were converted to the truth and baptized, probably in 1879, through listening to debates between the traveling brother Oatman and local preachers. This is reported from Webberville, Texas, by W.A. Oatman in The Christadelphian for January 1880. Webberville still exists as a very small community just east of Austin. This is where my great-grandparents, Sam and Eliza Johnson, spent their last years. 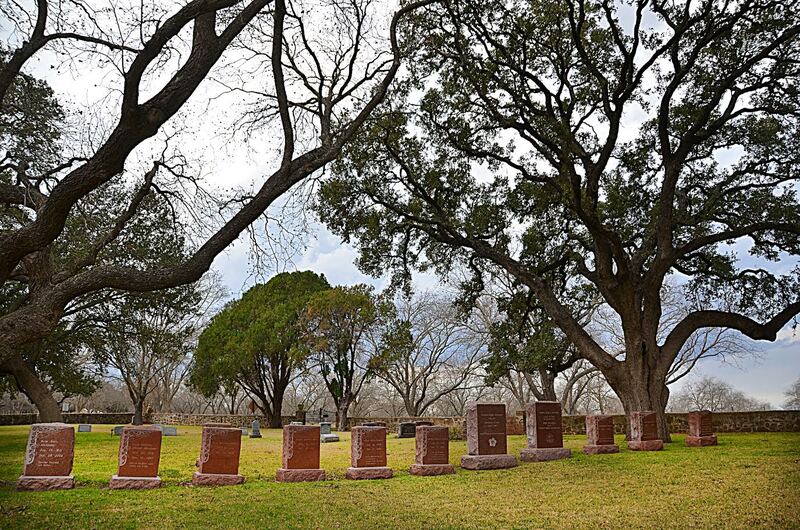 It is also on the Johnson Ranch property, and very near the Johnson Family Cemetery. Sam Johnson was an extraordinary character– one of those men who, with his wife by his side, tamed a frontier wilderness and made it a home. He left a mark on the land and the people who followed. He was a cattle rancher and trail-driver, raising and buying cattle that he and his brother herded north over the cattle trails through Oklahoma and Kansas, to the railhead for shipment to St Louis and Chicago and the big eastern cities. He made a fortune, lost a fortune, and repeated the process again in a highly volatile and risky business. In between, he was active in state politics and campaigned for a seat in the Texas State Legislature, but apparently saw public service as a passing duty to be discharged, not a career.